Saturday- 16th March 2013 was my date with the Dessert Queen!! 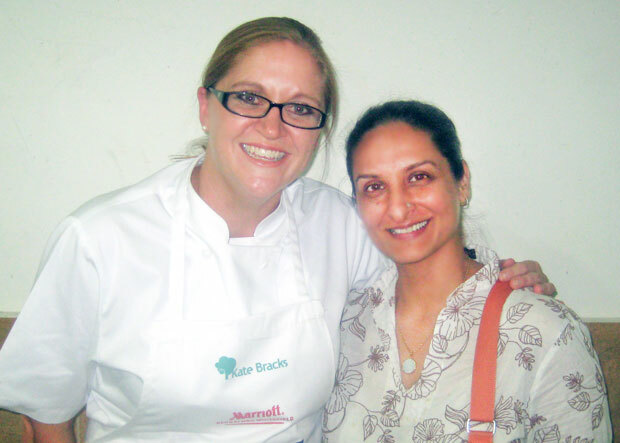 I got to attend a Master Chef Class with Kate Bracks– the winner of the 2011 Master Chef title. I got the VIP treatment. How? Well it helps that I bake well (even if I say so myself!! ), I make a mean brownie and do all these in very healthy versions. But that alone was not enough. Though I wish it were. The secret is that I feed my friends the baked goodies!! So when my friend, the one with the press privileges – (who had already had a ‘one- on- one’ with Kate Bracks) – got to take a few friends along for the ‘Junta’ do… she took me along. Ha ha! The six of us cut through lines and went into this gigantic hall with some 500 seats. A massive stage with a fully functional kitchen set-up, complete with everything neatly diced/sliced, chopped up, measured, placed and labelled. We got to sit on seats ‘Reserved‘ for us right up front. Now all this ordinarily is not something that would make me bat an eyelid. The reason I was and still am going all goo- goo eyed is because upfront meant that ALL of the delicious aromas wafting up and around made it to my olfactory nerves faster than they would otherwise have. And as they say the proof of the pudding is in the tasting- well I got to taste it almost as soon as it got off the stage. Actually it entered from the side door- but that’s’ just trivial details. 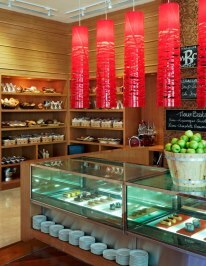 Kate has been in town for the last week to launch the ‘Whitefield Baking Company‘ at the Marriot Hotel here in Bangalore. Warm, exuberant and a live wire. She totally commands the stage. And does not stay in one position long enough to take a decent photograph!! So I did not get one. I got a dozen but not one decent one! The thing that impressed me the most about her was the absolute delight she took in bringing volunteers on to the stage and actually allowing them to do the work while she kind of supervised. There were no ‘airs’ of being a celebrated Chef at all!! Backstage, while I got to speak with her for a bit and get the customary photograph and autograph, she did not loose her cool even for a nano second while she signed a gazillion note books and papers for others. All this after having finished three grueling hours on stage, and with full knowledge of the fact that she would have to go back on in 30mins for the next session. That quality in her and her ready smile means a lot more in my book then any title world over. So all in all, I am on the right track. 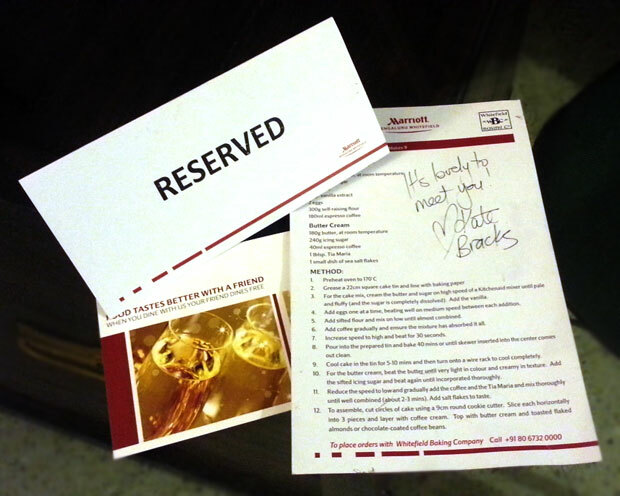 So why a blog post about Kate and a Master Chef class? Art is like cooking. For a successful dish, everything needs to have balance. It’s the right combination of salt, sour, sweet and spice. But the secret ingredient is texture. For art- It’s feeling. And in the end it’s about patience and practice- ‘Riyaz’. This entry was posted in Happy Happenings. Bookmark the permalink. @ Swati- 🙂 It was wonderful to have you over. @ Anju- That is so sweet of you to say. Come on over, would love to feed you all again.